This well maintained and nicely decorated oceanside home is just a short walk from the beach and offers a 12' x 25' private pool, large screened porch, lots of deck space, and common areas on each of its three floors. 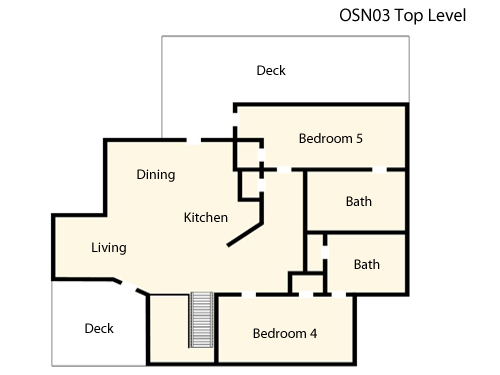 The top floor includes an open concept living room/dining room/kitchen space with cathedral ceilings, a TV, DVD player, along with front and rear decks and two master bedrooms, one with a large jetted tub, walk-in shower and deck access. 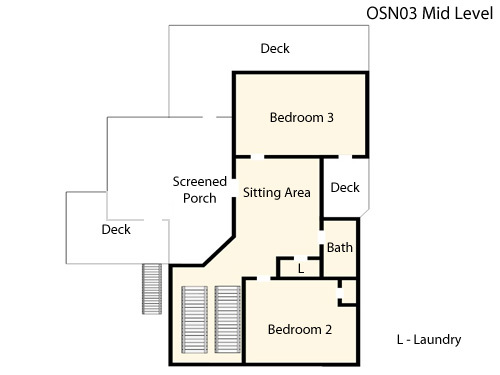 In addition to two bedrooms (one with its own deck), a bathroom and a laundry area, the second floor offers a roomy screened porch with plenty of seating. Plus, more shared deck space with a picnic table and a rope hammock. 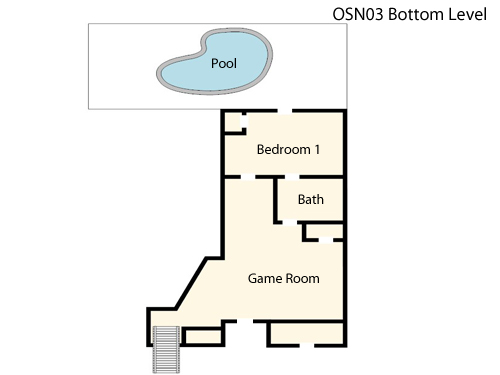 The first floor includes a bedroom with adjoining bath and a rec room with pool table, wet bar, mini-fridge and flat screen TV. Outside, along with the pool, you’ll find a grill and an outdoor shower and sink. A cul-de-sac location, no rear neighbors and a six-foot fence increase your outdoor privacy. Shops, restaurants, mini-golf, a movie theater, ABC store, two large grocery stores, kayak rentals, and a championship golf course are all very close by; yet, the neighborhood’s quiet enough that it’s not uncommon to see deer roaming about. Non-smoking. Pet Friendly - Dogs Only. Ask about our Military Discount. We had issues with cleanliness, the air conditioning, a grill with rusted through burners, , and falling wallpaper. Village Realty was responsive to our concerns but the property could use some attention and preventative maintenance. All properties are inspected before the start of the summer season and all are cleaned by Village-managed teams to ensure the best possible guest experience. Still, from time-to-time, as with any home, issues do surface to which we respond as quickly as possible. In this home, the A/C components are relatively new and the blown fuse which was the source of the problem you experienced was quickly repaired. The owners of this property, who work every off-season to make it even more appealing each year, have let us know that by June the wallpapered bedroom will be freshly painted and as inviting as the rest of the home. Brian, Thank you for your feedback and for responding to our follow up call regarding your recent stay with Village. Again, we're sorry you were not completely satisfied with your rental this year. We have shared your comments with our team as we're always striving to improve our guest experience. House was comfortable, nicely decorated and well equipped however there were 3 disappointing items. 1) the pool area was overgrown with grass/weeds making the pool area unattractive. 2) pool access was unusual in that you had to come out of the front of the house and walk around the side to get to the pool 3) outdoor shower had zero water pressure. Thank you again for taking the time to provide us feedback. Thank you so much for taking the time to submit this survey, we do rely on our guests feedback to improve. The pool has been cleared of overgrowth and the outside shower has been repaired. To make guests poolside experiences more comfortable and appealing, the owner of this home has just installed a large deck and has ensured ongoing maintenance of the backyard. Please give us a call if there is anything at all that we can take care of while you are at the property. We are very sorry for these inconveniences that you experienced. Overall we were very satisfied with our vacation. The only complaint (and hence the 3 rating) is the neighborhood policy of "booting" cars that are temporarily parked out of a driveway. One of our guests needed to move his car to allow a second guest to travel to the grocery store. He briefly parked his car on the property and off the street. In the short time he was there, his car was booted and needed to pay $170 to have it removed; an outrageous and unspecified amount. If it is the neighborhood's policy to disable vehicles, the fine should be clearly specified and not left to a local contactor to charge whatever he can. We routinely vacation on the outer banks and never had to deal with this type of treatment directed toward guests who pay a considerable amonunt of money to rent a home. We will think twice before renting another home in this neighborhood. Were sorry to learn of this unfortunate event. Strict enforcement of no on-street parking rules is common in the oceanside communities of Corolla. Clearly posted signs at community entrances help ensure beaches are available to neighborhood residents and guests only, enhancing your beach-going experience. And, to increase guests awareness of these parking rules, we point this out in our welcome paperwork and post reminders on refrigerators in the homes. Fortunately, this house provides more than enough driveway parking space for six cars.